In need of a quick weeknight side dish? 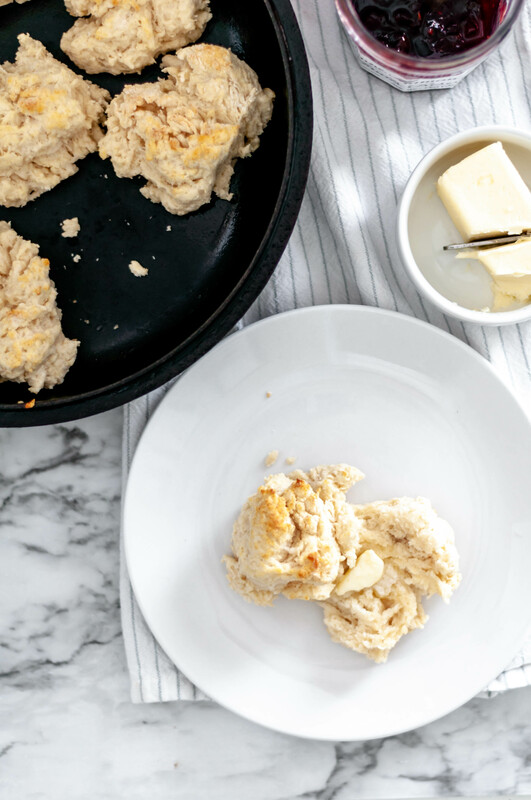 These skillet drop biscuits can be whipped up and ready in 30 minutes. It’s seriously hard to believe Thanksgiving is only a few weeks away. It’s been unseasonably warm around here so I keep forgetting it’s already November. And as much as I love Thanksgiving, I am really ready for Christmas this year. Noah wants to put up the Christmas tree already and I’m thinking he has the right idea and might pull it out this weekend. Don’t judge. We always go to our parents houses for the holidays so I don’t plan the menu but if I did, I’m pretty sure these skillet drop biscuits would be on it. Don’t get me wrong, I love a good, buttery roll (like, seriously love) but they take up some major time and tend to be a lot of work. That can add a lot of undue stress to the already busy holidays. But, these biscuits take less than 30 minutes from start to finish so they would be a great alternative for a low stress holiday. Or just serve them up alongside your dinner one night to fancy it up. Or for breakfast with an egg and some bacon sandwiched between. Or slathered in sausage gravy. Can you tell I love biscuits? Well, all carbs. I think I might need this shirt. Another bonus – the ingredients are pantry staples so you can have biscuits with little effort and time whenever the craving strikes. I love to have recipes like this in my back pocket. If you don’t have a cast iron skillet, no worries. You can bake these on a baking sheet instead. I prefer a cast iron skillet because it creates a yummy, crisper texture on the bottom of the biscuits. That’s an important part of biscuits if you ask me. Also, I’m taking requests for holiday recipes you want to see featured. Desserts, appetizers, sides? Let me know and I’ll try my best to share a delicious version! Just a few pantry staples and a few minutes are needed for these tender Skillet Drop Biscuits. Serve them hot with butter and jam. Preheat oven to 450 degrees F. In a large bowl, combine flour, baking powder and salt. Add the small pieces of shortening. Cut together the ingredients using a pastry cutter or two fork until the mixture is pea size lumps. Add milk and stir until is just comes together. Grease a cast iron skillet with additional shortening. Drop the biscuit mixture in about 1/4 cup mounds into the skillet, forming 8 biscuits. They should be rough looking.